If those eye goggles look familiar to you, there’s a good reason. You have certainly seen a plethora of photographs from Burning Man, arguably the most famous festival gathering in the Western world. Burning Man takes place in northern Nevada, just one state over, and many of its principles are in place at Wasteland Weekend. As at Burning Man, the goggles are not only a fashion statement, but are quite a practical accessory used to keep the wearer’s eyes safe from the copious amounts of sand and grit flying around in the harsh winds of the desert. 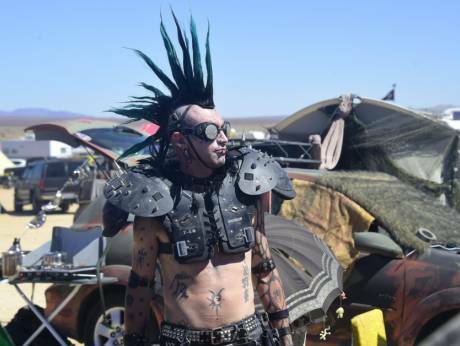 Wasteland Weekend definitely owes some of its aesthetic origins to Burning Man, but it’s intended to be a space to explore the universe of the Mad Max franchise’s dystopia.